Today we are going to announce a speed test between the newly released iPhone XS Max and the iPhone X. iPhone XS Max supports A12 bionic chip offering 15% performance better than the A11 bionic chip that inside the iPhone X However, with iOS 12 bringing performance improvements for older iOS devices as well, many users wondered if the iPhone XS brought about any meaningful performance improvements to the table or not. YouTuber EverythingApplePro below shows, the iPhone XS and iPhone X are both incredibly fast in opening apps. 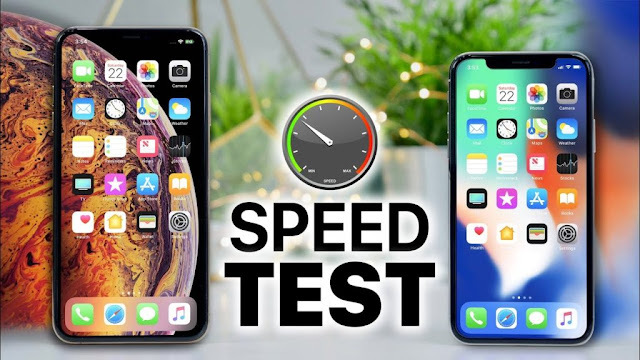 In the starting stages of the speed test, both phones were performing similarly but as once started to load more apps, the extra GB of RAM on the iPhone XS Max came in handy as it did not slow down while loading heavy apps like Asphalt 9 or Super Mario Run. The iPhone XS Max was also significantly faster than the iPhone X in importing, compiling, and exporting a 4K video. The iPhone XS Max finished the first round of the speed test in 2 minutes 10 seconds, while the iPhone X took 2 minutes 44 seconds. Despite coming with 4GB RAM though, the iPhone XS Max unloaded the majority of the apps, though the iPhone X fared even worse with only 3GB RAM. In the second round of the test, the iPhone XS Max took 43 seconds while the iPhone X took almost a minute. Overall though, it looks like the additional gig of RAM on the iPhone XS Max does not have a massive impact on multitasking. So what do you think ? Did you notice a better speed performance in your iPhone X on iOS 12?